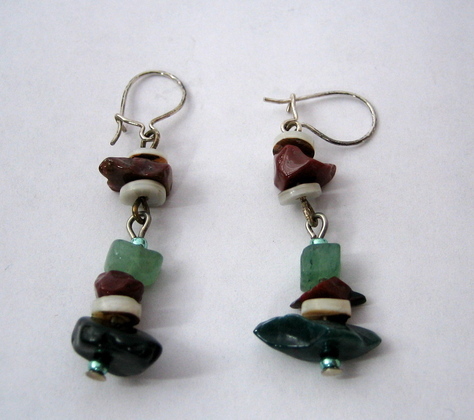 Pair of handmade drop earrings with semi-precious stones on silver wires for pierced ears. 4 stone chips in amber-burgundy, celadon green, and dark green on each strand, with 3 mother-of-pearl beads and 2 green glass beads. Created by a Pennsylvania jewelry and glass artisan. Fun, relaxed look.